I started this blog ten years and two months ago. It was a curiosity, but it just seemed to grow and grow and soon it became a night job (I tend to write and post at night). In the first few years, I would post over seven times a week. There was so much to write about. Lately I have slowed down. During the last year, I have posted slightly more than four posts a week. Essentially, it takes a lot of energy and focus to keep the pace up. Moreover, lately if I got the feeling that a post was a repeat topic even if it was “news”, I would skip it. Well, while I will write about the recent election and the upcoming election, I think I will slow it down a little bit for a while. I just can’t see keeping up the pace for another six years. I know I will not stop, I like writing and the exchange of ideas. But I have lately abandoned my orchids blog (No post since May!) to say nothing of my truly abandoned technical analysis blog. ( A post in May?) I would truly like to revive the first one and see if I can post regularly on the second one. Forget the Devil in Spanish, nobody reads it, the market for Spanish blogs does not seem to work, ask CC or me. I know the regional elections will make me post and Chavez’ Government dealing with the distortions in the economy next year should be interesting to talk about. But I really plan to slow down. There will be no translation of posts, no posts during vacations and no reproduction of other posts. No boring financial posts where people don’t comment. So, I will start with this post, in which I will discuss many things, rather than a single topic, just to keep my new election resolution. 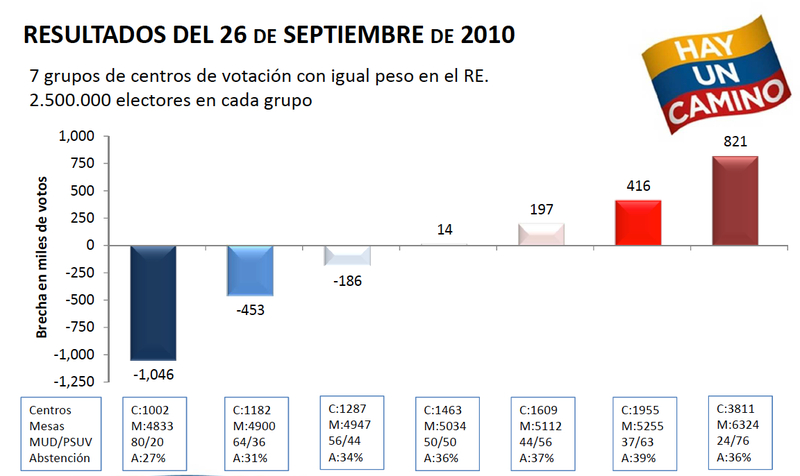 In this graph, I modeled the 2010 Parliamentary elections and asked: If I shift abstention in the more Chavista centers, by how much do I need to change it to make the votes a tie in 2010 when abstention was 32%. I was scared by the answer. It was just 4%. To me this meant that if abstention was below 25%, we were doomed. However, all of the reputable pollsters were saying abstention would be around 27 to 28%. Thus, I was not worried, particularly since abstention in Chavista centers was more than 35% on average in the Parliamentary election. Thus, 25% seemed sooo far away. But it wasn’t. Chavista money and machinery got the voters to go and vote and abstention was below 20%. Even in the pro-opposition centers, the increase in opposition votes was compensated by Chavista votes. One to one. Thus, we had no gain from 2010, but they did, they had an increase of almost 16% in turnout. And we were killed, wiped out. Yes, we improved by over 2 million votes, that is the positive. They only got 600-plus thousand more votes, but they killed us. Please understand the impact of abstention on the recent vote. To me, it is the whole story. I don’t like the idea. The “people” elected Ocariz as the candidate in a primary. Ocariz should be it, the people have spoken.I know there is a problem in Sucre, but Sucre is the problem, not Miranda. Capriles should be the leader of the opposition. He should continue going around the country, this time campaigning for all the candidates for Governor, working for unity. He should be above the fray, ready to run for President if the need arose in the next few years. To begin with, there is the risk that he could lose. Yeah! Laugh at me! Jaua beating Capriles!… Chavez did. And a demoralized or not fully unified opposition may not go out and vote on December 16th., but Chavismo may use the same PSUV lists and Mision Vivienda lists it used last Sunday to screw us. Sure, some opposition parties and people did not help Capriles. He should go out and help them, that is what leadership is about. All out! Capriles going around Venezuela as if he was still the candidate. I know you all disagree with me, but there it is! Well, the successor has finally been chosen. Why it took so long is hard to figure out. But Maduro was the best choice in terms of keeping the people happy. There is no other interpretation in my mind: Chávez will start promoting Maduro as his successor from now on. I will only change my mind if the consanguinity limitation is changed in the Constitution. Nicolas Maduro is liked by all but the military side of the Chavista Government and he talks to them. He has a good image and polls well. Have Chávez start saying he is great and his successor and Chavismo will have a reasonable candidate to go with the formidable machinery and deep pockets. Moreover, Maduro even talks to the opposition, he is less radical than Jaua and a moderate. His only drawback is that the only position he has ever run for is Metro union President. But he makes sense. I never bought the argument Capriles beat Diosdado in Miranda and that shows how good he is No, Diosdado was weak. The proof was that Capriles barely beat Diosdado in Miranda. Think about it! So, stay focused, don’t get mad, get even and vote and organize in December. It is the only way.